I’ve been on a total quinoa kick lately. 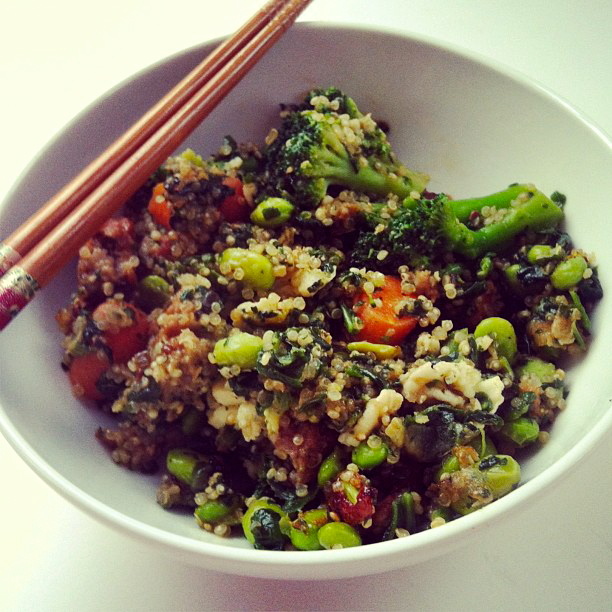 It started with that quinoa fried rice, and I’ve been hooked on this super-food grain ever since. Overnight oats are one of my staples during the school week, they can be prepared at night and devoured in the morning. They keep me full of energy all morning so that I can search for my gym clothes and take my math quizzes without having to stop at the vending machine. Quinoa is a wonderfully nutty, crunchy alternative to classic oats, plus it’s loaded with protein. That means that I can substitute my usual Greek yogurt for something even creamier and delicious: coconut milk. The rich, creamy, coconutty milk seeps into the fluffy quinoa overnight, along with some chia seeds. Now that’s something to wake up for! Since winter break started, I’ve been waking up at 10:30 and staying up until 2:00. I just realized that school starts on Wednesday… but I have faith that this quinoa will lure me out of bed despite the fact that I’m going out yet again for New Years Eve tonight. Think of this “recipe” as more of an outline — and top this quinoa off with any fruit, nut, or milk you like. for 15 minutes until quinoa can be fluffed with a fork. Combine the cooked quinoa along with the coconut milk and chia seeds in a container with a lid and let chill in the fridge overnight. Divide quinoa into two bowls then top with bananas and kiwi slices. Sprinkle with coconut and pumpkin seeds. We don’t have a cafeteria at my school, but we are allowed to go out into the town for lunch to Chipotle, McDonalds, Papa Johns, Panera (a personal favorite! ), and other fast-food places. However, going out to lunch can get quite expensive. That’s why I usually bring my lunch to school. Bringing my lunch doesn’t have to be soggy, cold, or depressing. If I say so myself, this salad is quite the opposite. It’s full of fresh herbs and veggies. The quinoa gives it a nice texture and adds a lot of protein to keep me going throughout the day. The lemon dressing and tangy feta cheese make it simply perfect. I’d take this over an $8 Panera panini anyday! Do you bring your lunch? Note: this recipe makes a lot, so I like to keep it in the fridge and scoop it out throughout the week. and set aside in the refrigerator until needed. least 2 hours and up to overnight. I like to cook my chicken in the panini maker, but any grill will do. It takes about 5 minutes in the panini maker. Cook the quinoa as directed on the box, and allow to cool. to serve, toss in the feta cheese and enough dressing to lightly coat. Eat cold or at room temperature and serve with the warm chicken.